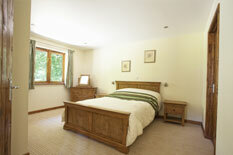 The living space in Hazel lodge is all open plan, giving a roomy, airy feel to the lodge. 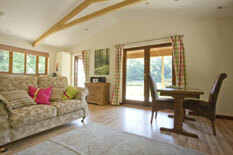 The large and comfey sofas are a great place to relax in front of the wood burner. The lodge has digital television installed and a stereo, so you don't have to miss your favourite shows while you're away on holiday! The large kitchen area has ample space and utensils for the preparation of any dish. Generous cupboard space is provided so that you can store all of the supplies you'll need for your stay. 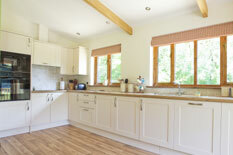 The kitchen is fitted with a fridge/freezer, washing machine and dish washer. 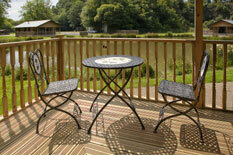 The lodge offers sleeping accommodation for two people - a single double bedroom. 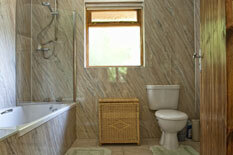 The bathroom is fitted with a basin, lavatory, bath and shower and is tiled throughout. The view from the lounge area of the lodge, showing the external eating area.